THE HPSC-1 PROVIDES PRESSURES UP TO 1000 PSI PROVIDES A FAST ECONOMICAL CLEANING SOLUTION FOR HEAVY DUTY, LARGE PARTS CLEANING. WITH A 500 LBS. 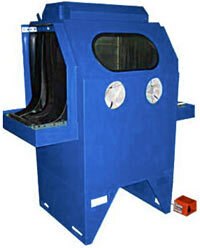 WORK LOAD CONVEYOR, DUEL RUBBER CURTAINS ON EACH END AND ROLLER CONVEYOR MAKES FOR EASY ACCESS AND INCREASED PRODUCTION. THE INDUSTRIAL STRENGTH DIAPHRAGM PUMP GIVES THIS UNIT LONG LIFE IN INDUSTRIAL SETTINGS. Double rubber curtains for easy access. 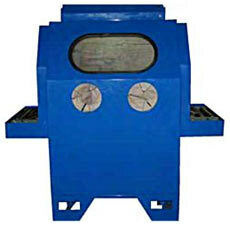 HPSC-1 WASHERS CAN BE CONSTRUCTED OF STAINLESS OR CARBON STEEL. CHOOSE FROM OUR STANDARD MODELS OR LET US CUSTOM BUILD A UNIT TO MEET YOUR NEEDS.